Today was an "Oh, shoot! I haven't taken a picture of anything yet." day. We went to church. Came home, had lunch. I helped Meg redo the last popcorn popping for her experiment. We dropped the kids off at my parents' so we could go to an open house. Didn't love the house. Picked the kids up. Mickey helped Meg with her layout for the science project. Had dinner. Read scriptures. Mickey helped Meg some more. 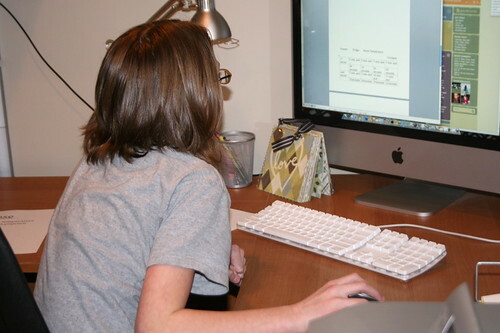 So I thought it would be fitting to get a picture of Meg typing up her info. The project is due on Friday. I think if she works at it a little every day it will get done. By the way, Meg found out that when you store your popcorn (non-microwave) in the refrigerator you get the best popping results.